Written about 705 in the form of a letter, the prologue of Bede's verse 'Live of St Cuthbert' addressed a priest named John, who was setting out on a pilgrimage to Rome. Bede intended that the poem provide solace during the difficulties of the long journey. 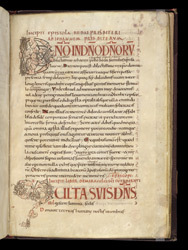 The first letters of the prologue and beginning of the poem are decorated with the imaginary beast heads and classical plant forms which are typical of late 10th- to early 11th-century Anglo-Saxon ornament.